A long wait for the feature that allows users to watch YouTube videos without leaving WhatsApp chat is finally rolling out for iPhone. This means that if an iOS user receives a YouTube link in his chat then he can watch the video right there, instead of being redirected to the YouTube app. WhatsApp is rolling out this feature for all its iOS users in phases. The users only need to visit App Store and update WhatsApp to version 2.18.11. However, if you are an Android or Windows user then you need to be more patient as, for now WhatsApp has shown no sign of releasing this feature in near future. How to Watch YouTube Videos Without Leaving WhatsApp? To start watching video within your chats you simply either need to send or receive a YouTube video. In the shared/received video you will now find a Play button. Tap on the Play button to start the video. Now, you will find the video playing right there on WhatsApp, that was earlier redirected to YouTube app or site. You will also get the option in the video to maximize it, pause it or close it. What we found more interesting was that the video continues to play even though we leave the chat on which video is received. This means you can continue watching the video while chatting with your friends and family. You can also move that video anywhere on your screen, however, the video will only be placed at either top or bottom of the screen. Another thing which we spotted is when you right swipe the video, video gets paused and hide so that you get a clear view of your chats. If you wish to resume the video again you can click on the arrow. 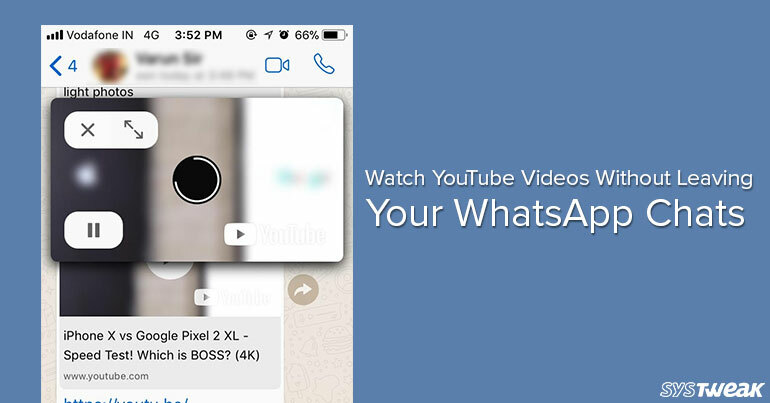 This new integration of YouTube with WhatsApp that helps users in watching YouTube videos right there on WhatsApp itself surely a multitasking feature. A user now can continue with his chats along with enjoying the videos. If you are an iOS user and are still unable to use this feature then you have to wait, as this feature is gradually rolling out. But Android and Windows users will remain deprived of this feature probably as there is no news from WhatsApp to roll this feature for both platforms.